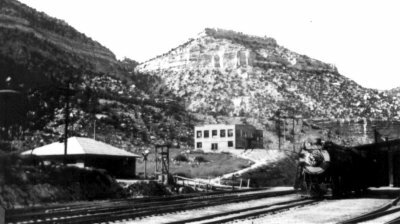 The Utah Railway's main operating headquarters sits west of Martin, Utah on a narrow shelf of Mancos shale in a late steam era atmosphere. Many red brick buildings and dry-masonry culverts are still in use from former days. It all started in 1911 when A.B. Apperson, general superintendent of the Utah lines of the Denver and Rio Grande, had a dispute with H.U. Mudge, then the president of the D.& R.G. As a result of the conflict Apperson went to New York City where he showed a photograph to the financial interests active in the United States Smelting, Refining and Mining Company. This photo showed five steam engines pulling a nine car passenger train up the four-percent grade of Soldier Summit. Apperson then explained the difficulties the D.& R.G. 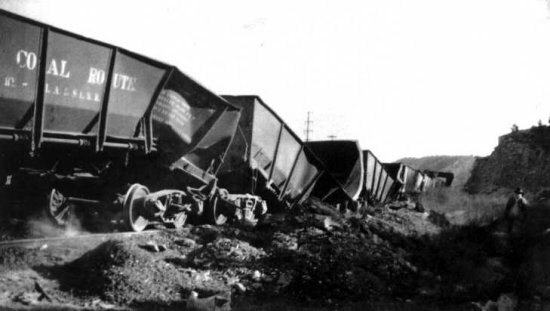 had hauling coal mined by them into Provo. 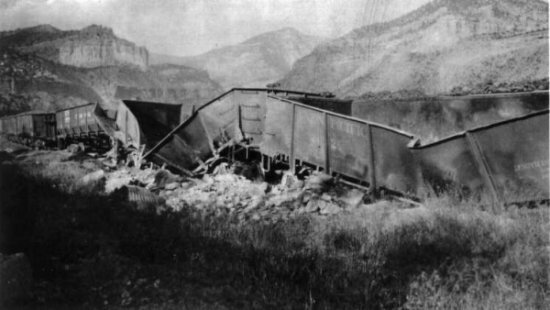 As a result the United States Smelting, Refining and Mining Company built the "Utah coal route" saying "It's wholly apparent that existing railroad faculties could not render competent service." 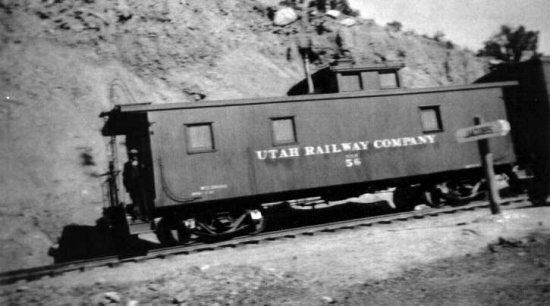 The Utah Railway Company was incorporated on January 24, 1912, in the State of Utah under the name of Utah Coal Railway Company. 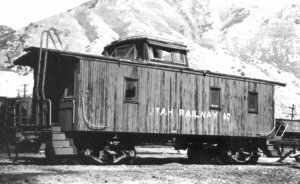 On May 4, 1912, it was amended to Utah Railway Company. It issued $125,000 of Capital Stock and $10,000,000 worth of six-percent, five year Gold Trust Notes. United States Smelting, Refining and Mining was appointed fiscal agent. The company's main desire was to build a railroad by the shortest, most direct route making connections with other coal distributing railroads. The first proposed route started from a point near Spanish Fork, then went through Spanish Fork and Huntington Canyons to Mohrland and Hiawatha. But after the in-depth surveys were done, they found it more practical to go through Carbon County. This line that the Utah Railway now proposed would somewhat parallel the D.& R.G. at a lesser grade and cross over it at Castle Gate. After about ten miles of grading of this line, the D.& R.G. made a proposal; they would complete their improvements and double track over the summit to Thistle. Then give the Utah Railway trackage rights on both, if the Utah Railway would give them trackage rights on their line from Thistle to Provo; forming a joint-operated, double-track line. Much later, after extended negotiations and government interventions, these arrangements were formed into a trackage agreement dated November 1, 1913 that could continue into perpetuity. These negotiations took about 20 months, and since the construction had started on the Castle Gate line it now had to be abandoned at a cost of $249,945 on July 1, 1913. Meanwhile the construction of the main line from Mohrland to the Utah Railway junction and the Martin yard started in October of 1912 and was completed on October 31, 1914 at a cost of $3,383,510. This included the Gordon Creek Bridge and Black Hawk-Mohrland line. All efforts at this time were financed by money from the mother Company on short-term notes because the government had closed the escrow account of the Utah Railway until the for-mentioned trackage agreement could be reached. Two of the best features of the main line were (are) the Italian dry-masonry culverts and the Gordon Creek Bridge. It is the longest steel girder bridge if its height in the State of Utah. It's still in use and stands 135 feet tall, 634 feet long, and is built at a 60-percent curve. Half of the culverts are also in use, some contain rocks the size of small trucks. 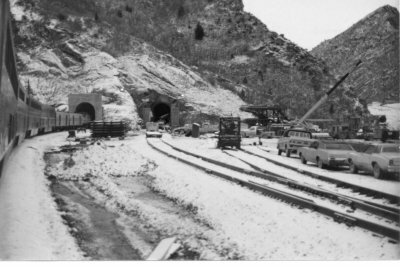 The Utah Railway was also responsible for building under contract the "Black Hawk-Mohrland cut-off line" for the Castle Valley Railway Company. The Utah Railway bought this line on the day of its completion for $246,911, which happens to be the same day it met and completed the main line. 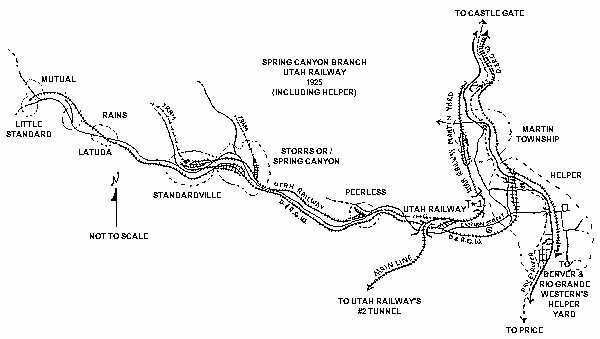 Now that the Utah Railway's main line was operational and the joint trackage was completed over the summit, arrangements were completed so the Denver and Rio Grande could operate the Utah Railway's lines under the 1913 trackage agreement. This commenced November 1, 1914. 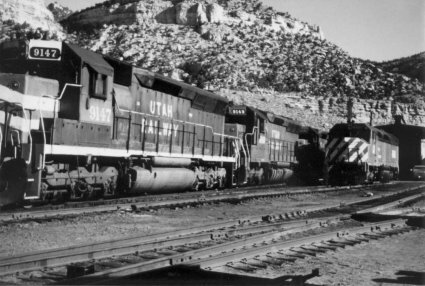 They ran mixed freight over the Utah Railway's tracks only for a short time, for it proved to be unacceptable. 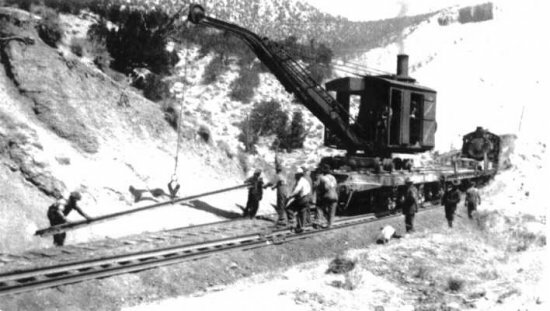 As a result, on November 30, 1917, the Utah Railway took over the operation of its own line. This now forced the company to buy locomotives, coal cars, and a railyard and terminal at Provo. 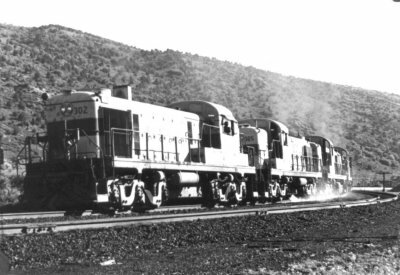 They joined with the San Pedro, Los Angeles and Salt Lake Railroad, now the Union Pacific, so that they could expedite the movement of their cars just after notice was given to the Denver and Rio Grande as per to the trackage agreement. 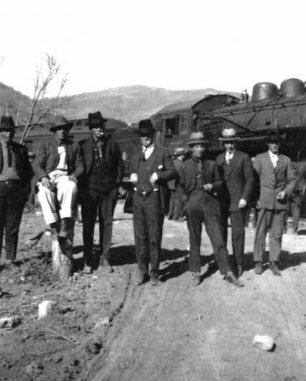 Independent operation by the Utah Railway began December 1, 1917 with the following equipment; four 2-10-2 type steam engines, four leased consolidation type engines from the Southern Utah Railroad, 522 steel gondola cars, 14 flat cars, and five cabooses. Just days later they were delivered two more 2-10-2 type engines and 1500 new steel gondola cars. They had scheduled daily (except Sunday), passenger, mixed freight, mail, and express services. Their passenger stops included the Utah Railway Junction, Martin (Helper), Spring Canyon Junction, Wildcat, Gordon Creek, Healy, Wattis Junction, Hiawatha and Mohrland. 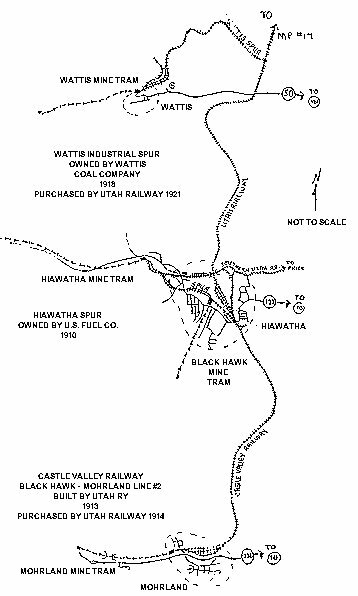 Their mine runs included Black Hawk, Mohrland, East Hiawatha and Panther Mines. 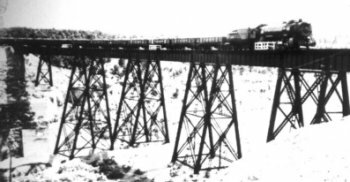 Their services superseded all the services of the struggling Southern Utah Railroad, due to a wash-out of its bridge over the Price river by the Mammoth Dam break on the Gooseberry Creek. 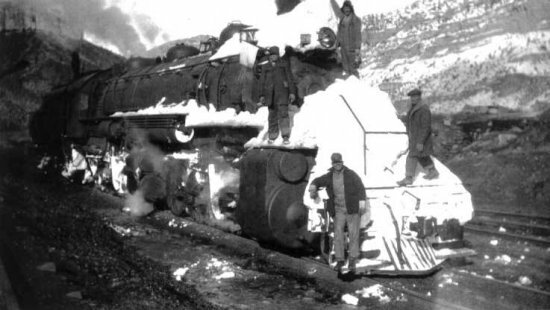 The Utah Railway did not run independently for long, because on December 28, 1917 the President of the United States proclaimed federal control of all railroad under World War I emergency. This was relinquished June 30, 1918. In the 1920's most railroads were able to buy-out or take-over other weak or struggling carriers due to a new government regulation. The Utah Railway was no exception. 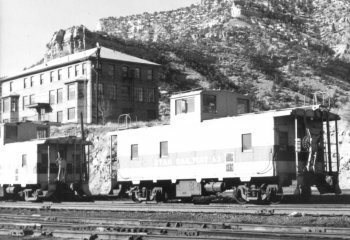 The Utah Railway began with purchasing the Wattis Industrial spur from the Wattis Coal Company for $170,954 on November 1, 1921. 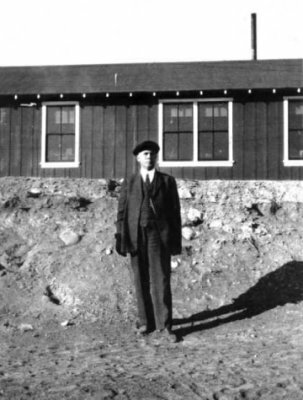 The next purchase was the Utah Terminal Railroad Company up Spring Canyon for $231,801 in 1923. They had been using this connection at Jacobs since 1920 under contract. It paralleled the D.& R.G. for 3.6 miles and serviced Peerless, Spring Canyon and Standard mines. This was the second buy-out in their local take over. The last acquisition appeared to be either a hostile take-over or a prearranged back-room deal. The circumstantial evidence points to the later, but in any event the company retained its own entity with-in the Utah Railway Company. This was the National Coal Railway up Consumers. 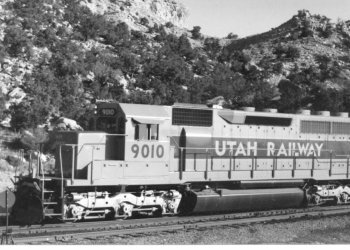 The Utah Railway optioned or purchased all their stock then submitted to the Public Utilities Commission of Utah and the Interstate Commerce Commission for control. This was granted on August 14, 1925 upon the following terms. To complete the sale of all stocks, to assume all expenses, obligations, and liabilities, and to pay the cost of the construction. The total cost of this acquisition was $589,082. Between 1918 and 1927 other changes, additions and improvements were made. This was called locally the "construction period." 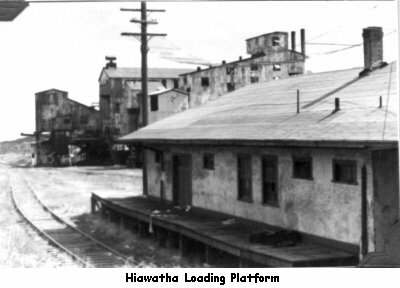 Some of the most notable happenings being: the building of bunkhouses for those railroad workers not residing at the locations they were needed; building a depot at Hiawatha in 1919; rebuilding the Martin (in 1922), Black Hawk-Mohrland (in 1919), and Hiawatha enginehouses (in 1920) after fires; putting in a telephone line in 1920; building a water tank at Martin for its and Helper City's use in 1927; the building of the Martin office building in 1927; and the repair of the track with 90-pound rail and 17,503 yards of gravel ballast. The also received their three big "mallets" steam engines in 1918, bring the roster to 16 units owned by the railway. Starting in the 1930's the Utah Railway had some slow years with coal mines playing out, towns being abandoned, and the Great Depression. This caused the retirement of the Standardville and Jex sidings in 1941-42, and the Panther and King #2 mines spurs in 1938-39. It would also cause the retirement of the National Railway branch in 1953. The Spring Canyon branch was never formally retired, although it has not seen any trains since the late 1960's. 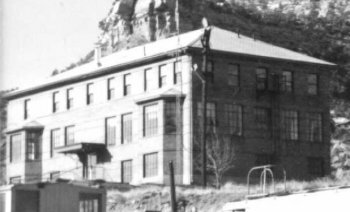 A misunderstanding would shorten this branch in 1988 when the Utah Division of Oil, Gas and mining tried to salvage the track under the Utah abandoned mine reclamation program. 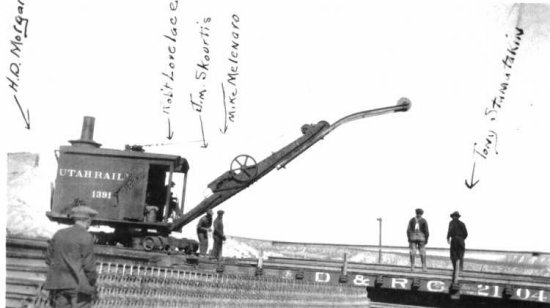 The Utah Railway has always kept one step ahead of other coal carriers in using modern technology. It purchased Alco diesel engines in 1952, moved from full side dump coal cars to cross dumps in the 1960's, and added the little black boxes, called F.R.E.D.s, in the place of the cabooses in 1985. The company also approved the new automated loading facilities at Wattis and Wild Cat, and started leasing power and their maintenance in 1985. First from Helm Leasing, then from Morrison-Knudsen in May 1991. And how lease additional engines from Aomni-tracx. The Utah Railway has not been immune to strikes, both in-house and out. Most of which has been violent. The first strike to effect the company was the coal miner strike of 1922. It was responsible for burning down the Martin enginehouse and killing a deputy riding a Utah Railway train. The latest strike to effect the Company was the Maintenance of Way strike of 1991, although it caused no trouble or damage. Today the Utah Railway trains continue to haul 12,000 tons of coal from local coal mines once a day, on a schedule you could almost set your clocks by. It lugs along the same path as they always have except for several miles of track and two new tunnel built to by-pass "Thistle Lake" in 1983, after a mud slide blocked the river and flooded the tracks for 81 days. All total, the Utah Railway owns 98 miles of track, another 205 miles they hold trackage rights, under the 1995 trackage agreement. Their serviceable fleet of SD40 engines sits at over 35, which is probably the highest ratio of horse power to miles operated in the nation. Locally, the Utah Railway carries about 55-percent of the coal produced, which is 99-percent of their haul. There is still about a trillion tons of this bituminous coal in reserves locally. So, as long as coal remains the fuel chosen by utilities, the Utah Railway will remain an awesome short line. 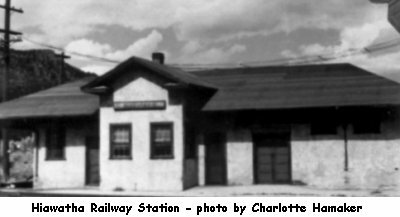 Ex-Castle Valley Railroad #104 - (Hiawatha to Price Line) - purchased 1 Jun 1918 - Retired 1956 - Steam Era - "2-8-0"
Main office building after third story boarding house was added. Click on map image for larger map. North of Hiawatha - laying a second line of track. 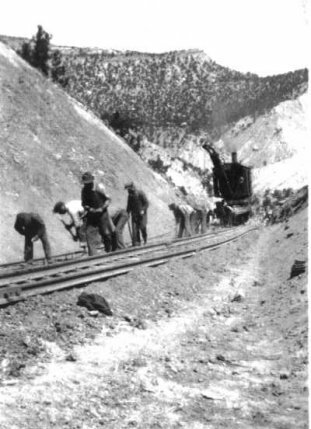 Extension work on railroad in Hiawatha - early 1920's. Wreckage from Tunnel #1 - Aug. 28, 1922 - 2:50 p.m.
Wreckage from Tunnel #1 from opposite direction. Inspectors of new rail work. Group just arrived on the passenger freight train pictured. They called him "Dad" Baker - one of the regular train men. TrainMovies.com - Charles Smiley offers a video movie entitled "Soldier Summit Reflections" that tells the story of the railroad lines passing through Soldier Summit, Colton, Castle Gate, Martin and Helper. 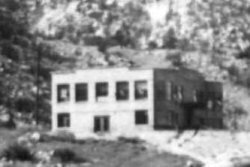 The town of Helper was named "Helper" because it housed the engines used to help the trains over the 2.4% grade between Helper and Soldier Summit. You can visit their webpage to learn more about the video. You can also contact Charles Smiley for more information.